Recreating the Earth's liquid iron core in the laboratory: a speck-sized piece of iron is thermally isolated and placed between the tips of two small conical diamonds. 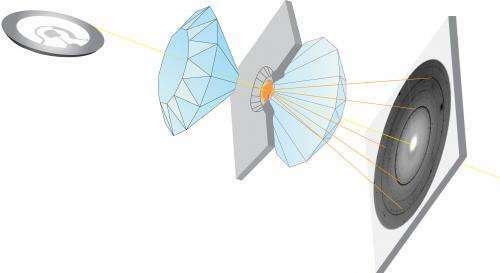 Pressing the two diamonds together produces pressures of 2 million atmospheres and more. As a laser beam heats the sample to temperatures of 3000 to 5000 degrees, a thin beam of synchrotron X-rays is used to detect whether it has started to melt. This will change its crystalline structure, in turn modifying the "diffraction pattern" of deflected X-rays behind the sample. Credit: ESRF/Denis Andrault. 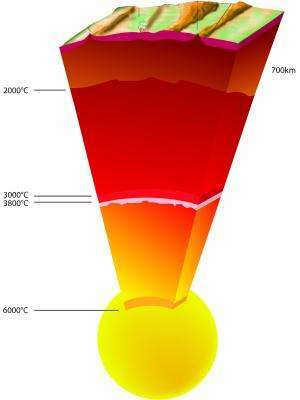 To generate an accurate picture of the temperature profile within the Earth's centre, scientists can look at the melting point of iron at different pressures in the laboratory, using a diamond anvil cell to compress speck-sized samples to pressures of several million atmospheres, and powerful laser beams to heat them to 4000 or even 5000 degrees Celsius. "In practice, many experimental challenges have to be met", explains Agnès Dewaele from CEA, "as the iron sample has to be insulated thermally and also must not be allowed to chemically react with its environment. Even if a sample reaches the extreme temperatures and pressures at the centre of the Earth, it will only do so for a matter of seconds. In this short timeframe it is extremely difficult to determine whether it has started to melt or is still solid". This is where X-rays come into play. 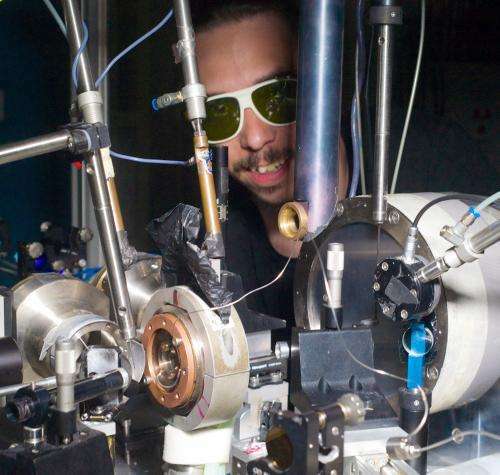 "We have developed a new technique where an intense beam of X-rays from the synchrotron can probe a sample and deduce whether it is solid, liquid or partially molten within as little as a second, using a process known diffraction", says Mohamed Mezouar from the ESRF, "and this is short enough to keep temperature and pressure constant, and at the same time avoid any chemical reactions". In this timeframe many phenomena like the supercooling and shock-waves reflection/interference may take place and affect the result. I'm confused. Isn't carbon, i.e. diamond, soluble in iron? Shouldn't that contaminate the sample and mess up the results? Shouldn't that contaminate the sample and mess up the results? The experiment is done so quickly that the carbon doesn't have tim to mix (few seconds). Dear Physorg designers! Could you please increase the number of lines of description under the pictures to make appearing of "more" button really rare event? This is scientific portal and long description are quite common and appreciated. Forcing readers to click almost every time the button, or even worst, enforcing shorter and less informative descriptions on authors is POINTLESS irrespective of how better it looks. Thank you. Dear physorg designers: some readers would rather click on the scroll button than the 'more' button. Might you have any idea why this is? Thanks for making these threads as short as possible, but I would appreciate the return of the multi-page format. Thanks. Question, how does the iron in the core, if it is 4000 degrees, remain magnetic? If i recall iron looses it's magnetization when it gets heated the Curie point. But would like to know what makes it stay magnetic. A new dimension for Global Warming! Down! It is not the intrinsic magnetism in the iron that creates the Earth's magnetic field, it is the relative angular motion difference of the core and mantle. The sun (or any star) has absolute temperatures in the millions kelvins. Yet they generate magnetic fields which are some of the strongest ever observed. Re the picture, I did not know that Jimmy hart had a physics background, although I understand this could come in handy in working out intricate wrestling moves and avoiding injury. This is really alarming. Something must be done to stop this warming. I propose taxes to deal with the problem. Nature's Law: Heavy stuff sinks to the bottom. Hence osmium, platinum, tungsten and gold at the center. But around this would settle a layer of uranium. Everything would be fine until enough uranium 235 settled out to go prompt critical creating a flash of energy that would mix things up again as the heat escaped. This would have been more frequent when the amount of U-235 was more abundant, Non-uniform fissioning events could have resulted in large "bubbles" of hot stuff working their way to the surface and now seen as the various trap formations around the planet. Even if it never went prompt critical it would still generate significant periodic bursts of heat with that heat mixing the layers again..
Come on guys:circular reasoning! >>"the earth has a magnetic field that is weakening yearly, and can't be very old, ergo there must be a mechanism to refresh it, otherwise the universe isn't billions of years old." This article merely shows some parameters that give the right answer, which proves nothing because the dynamo hypothesis is not observable in a real model. Furthermore, the extra 1,000 degrees are not directly observable. We know this whole experiment was designed to give a hotter core, simply to allow the dynamo hypothesis to have traction: it is dishonest to parade the result as if it were a byproduct of research. There actually has been at least one potential case of a "Natural nuclear reactor" found. I tend to agree with you that given the densities of other heavier metals they should in principle sink first, however, materials behave in unexpected ways under extreme conditions. For example, intuitively you would expect CO2, N2, and O2 to be stratified by density in the atmosphere, but instead they are usually well mixed. So that would immediately provide an example of why densest material doesn't necessarily sink to the core of a planet. If the Earth is made from the same stuff as asteroids, then there should be truly enormous amounts of Gold and Platinum and other heavy elements in the mantle and core, even though they only make up less than 1% of the total mass. One thousandth of one percent of 6*10^24kg is still 6*10^19kg of precious metals. That's probably more than the mass of the Earth's Crust. "This is really alarming. Something must be done to stop this warming. I propose taxes to deal with the problem." This is really trolling. Something must be done to stop this spamming. I propose mandatory courses in critical thinking to deal with the problem. And spare me the straw-man; I personally agree that the initial comment was trolling. But, so what? This is an open forum. If you mean to defend trolling then you're in for a rough time here. If the wind was not constantly churning the atmosphere the CO2 would settle out and will do so in a confined space. Just ask a dead CO2 delivery man. So does oxygen and presents a danger in hospitals and home use COPD patients. There is vast chasm that separates the mechanical behavior of atoms of low atomic number in the atomosphere and those of high atomic mass near the center of the Earth. The pressure should keep the osmium etc. from doing much bumping around (boiling). Big atoms in close contact = little travel, thus a slow settling process resulting in periodic nuclear "fizzles" generating great blobs of heat. The opposite side of the core would be unfazed by said fizzle and remain unmixed allowing the U-235 to fission when it settles out to the critical point. I'm not suggesting atomic bombs going off. Just sequences of natural isotope separation over geological periods of time with natural consequences. And we see the results as the trap formations. Anyway, it's just another cyclical event. There is the off chance that the core actually IS getting hotter. Just how might that happen? 1) Radioactive decay does generate heat throughout the volume of the planet. If more heat is generated via radioactive decay than is radiated away then the Erth's interior could heat up over time. Heavier elements are more likely to undergo radioactive decay - and those should be found closer to the core. 2) Tidal heating of (semi-) liquid parts by the Moon's influence. Since I am not a geologist, just an inter-disciplinary observer, couldn't tell ya an exact mechanism. Not saying it was probability, just one of a number of possibilities(notice I said OFF chance?). Hat's off to Anti, though, for providing a group of more precise explanations, any of which alone(not as likely) or in combination(more likely), could explain my thought experiment. With the energy increase coming from where? The possible heat rise as suggested by Anti, Maybe? In re. tidal forces, given that the Earth and its contents are not at rest, but comprise a rotating gravity well revolving about another rotating gravity well, the Sun, which is revolving about another rotating gravity well, our galaxy, Earth's core is itself in a constant state of motion, such that it is mixing, with part of it being continuously ejected as magma, which carries thermal energy away from the core. Considering Earth's age, how much fissile material might reasonably remain in the core? Many isotopes of heavier elements have half-lives of billions of years. The most common uranium is 5 Gyr or there abouts. Also hot material in the lower mantle is carried up by convection. The mention of "magnetospheric currents" was as a cause of increased heat, not a result. And, no, heat will not increase such currents. The question, though is how much of such might still remain in the core. Well for uranium 238 about half of what was there when the earth formed. Because the half-live of u 238 is about 4.5 Gyr. For uranium 235 significantly less, it's half life is about 700 millions of years. Ya just have to google up the other unstable isotopes. Most of the elements have several unstable isotopes, carbon, oxygen, iron, magnesium, iodine, etc,,,,, each isotope has it's own half-life. Any unstable isotope decays and releases energy,,,, not just the ones that people most know, uranium, polonium, radon, strontium, etc. cantdrive thinks that electricity is the only thing in the universe. But, do we know what fractions of the initial amounts remain in the core? On the other hand, do we have any idea what fractions have yet to reach the core? Not being a geologist or a geophysicist I'm guessing that these are things that we do not yet well know. Good question. As Q points out: there are elements with long half lives. Then again: such elements tend to decay slowly (long half life - duh) - so they don't tend to produce much heat per kg of matrial per second. The biggest argument in favor could be that it's a volumetric process, whereas radiation away from Earth is just a surface process. A low activity volumetric process can overcome any high activity surface process if the diameter is big enough. Also the Earth's mantle (and especially the atmosphere) are very good insulating blankets against heat loss. The Sun and it's connection to the galactic current, pretty basic stuff if you understood circuit theory. Exactly!, I did say if you understood. Electric currents can heat via induction, it's only rocket science for the densest among us. As one trained in, among other things, Physics and Electrical Engineering, I don't need you to explain induction to me. You clearly have no idea as to what an electrical current is and how it's conducted. The heat of Earth core is caused with radioactive decay, period. The "magnetospheric currents" have absolutely nothing with it - they're consuming heat for their formation, not generating. The proponents of Electric Universe are silly by the very definition of their theory. You're just "ducking" and "waving" the topic. What exactly is the "definition" of EUT? That's ironic, coming from a purveyor of junk science.